Top Gear famously put a star in a reasonably priced car. I want to put someone in today’s Nice Price or Crack Pipe rotary-powered Starlet, but only if it’s in fact determined to be, reasonably priced. Of the Seventies’ U.S.-built import fighters only AMC’s Gremlin managed to survive without some catastrophic brand hobbling malady afflicting it. Chevy’s Vega developed a reputation for rust and 20K engines, while Ford’s Pinto is best remembered for possibly serving its occupants well-done after a rearend accident. You don’t see all that many of any of those cars these days, bad or good, and none of you were happy to see the side panel damage inflicted on yesterday’s 1977 Gremlin X, which perhaps countered its sturdy gertie rep. That, the hand controls inside, and just a general yeah, well whatever attitude about Gremlins doomed the car’s four-grand asking to a 52% Crack Pipe loss. How About $4,000 for a 1977 AMC Gremlin X That’ll Lend You A Hand? Despite its diminutive size, that Gremlin still had a big-car drivetrain. Back in the Seventies and early Eighties FWD was still an anomaly rather than the norm. Toyota, worried that American buyers would freak the hell out if they saw a transverse engine under the hood introduced their first front-driver in the U.S. market - the Tercel - with a longitudinal engine much like an Audi. 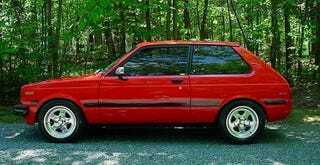 Around the same time, the company also hedged their bets by bringing over a tiny rear-driver called the Starlet. Here those were all three-door hatch econo-boxes, powered by a 1.3-litre OHV four and offering either 4- or 5-speed gearboxes. This 1981 Starlet however, has something a little bit smaller than that under its hood. In fact, what’s there is a Mazda 12A two-rotor Wankel, apparently late of an RX7. That’s fed through a Holley 4bbl and is mated to a 5-speed manual. The engine is also color coordinated to the rest of the car, if that’s your thing. Speaking of the rest of the car, it’s been set up for the strip, but still looks perfectly streetable if you’re not all about the carpet. Most guys like bare floors anyway, amiright? The interior also features a six-point cage, and a fuel cell in the back. The stock seats are present, however the cross bars on the cage look like they make the back seat for show only. On the outside the paint looks good and the ad notes no rot to speak of. The big bumper up front has been given a coat of something to make it all shiny, while the one in back has been given the heave-ho. Drag tires and wheels fill the arches, and behind those are disc brakes all around, plumbed with a line lock for all your tire-spinning pleasure. The present seller of the car doesn’t seem to know much about it, but claims to have recently added it to his driveway because he couldn’t pass it up. I guess he’s changed his mind now. He should learn a little more about it before offering it up however as he claims in the ad that the engine is fuel injected. He also claims that to be worth $7,500 and we’re now going to put that claim to the test. What do you think about this rotary rocket for $7,500? Is that a deal to make this Starlet your leading lady? Or, is that too much to ask for something with so many JEGS stickers? Charlotte NC Craigslist, or go here if the ad disappears. H/T to both KPKING and z3px for the hookup!